The road was built by the US Army in 1942. We had just entered World War II in response to the attack on Pearl Harbor—just a few islands away. The army wanted a road connecting the two sides of the island in the event that a Japanese invasion cut off the normal routes. They weren’t worried about things like lanes, or banked curves, or high speeds. Eventually it was handed over to the county or state, who opened it to civilian traffic and widened it to two lanes—by patching the sides, rather than actually re-laying it. According to our tour guide, the locals call it the “straddle road” because the best way to drive it is right down the middle, on the original roadbed, until you spot oncoming traffic. Let’s just say our rental contract forbid us to take the car on the road. Anyway, back to the scenery. 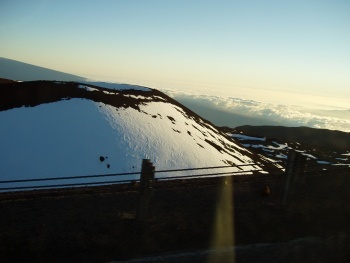 This is a view from maybe 10-11 thousand feet up the slopes of Mauna Kea, looking across the valley at Mauna Loa (which itself is 13,677 feet high!) 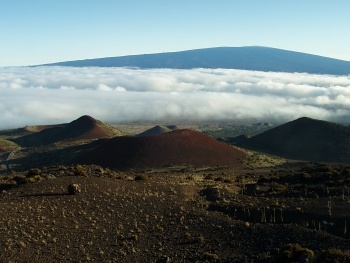 There are cinder cones all over from the last days of Mauna Kea’s volcanic career. One thing I found interesting is that the big mountains on Hawaii don’t look big until you put them in context because the slope is so shallow. It’s like a tilted plain that just keeps going up, and up, and up. 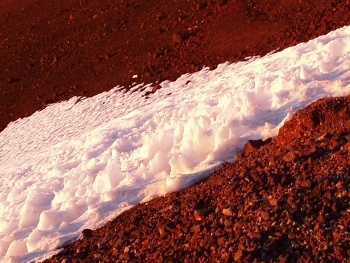 Of course, for something that shallow to reach 13,000 feet, it gets very wide too…Mauna Loa is apparently the largest mountain on Earth by volume! 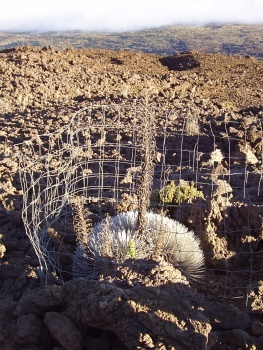 On the upper elevations on Mauna Kea…and just about nowhere else…grows the endangered Silversword . Park rangers actually planted one near the side of the road and put a fence around it so that visitors could see it without hiking through the 11,000-foot-high wilderness. 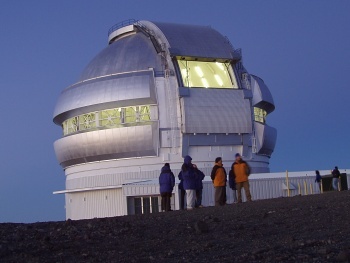 I believe these are the University of Hawaii 0.6-m Telescope, the United Kingdom Infrared Telescope, the University of Hawaii 2.2-m Telescope, and the Gemini Northern 8-m Telescope the Canada-France Hawaii telescope, the Gemini Telescope, the University of Hawaii 2.2 meter telescope, and the UK Infrared Telescope. 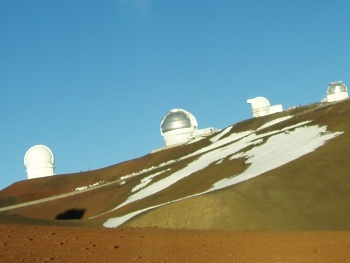 The Mauna Kea Observatories site has been very helpful in identifying these! The tour brought us to the summit just around sunset. It provided parkas for everyone…and we needed them! We parked near the UH 2.2-m scope, and walked around the small parking lot. 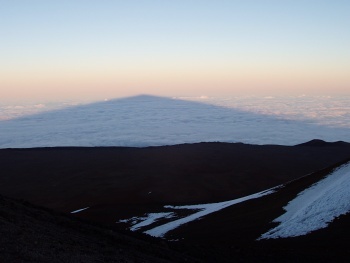 This next photo is of the actual highest point on Mauna Kea. It was sacred to the Hawaiians (and presumably still is to some), who had built a small prayer altar at the true summit. On the western slope of the hill (if you can call it that) where we were standing, a lot of the snow had formed into strange patterns like upside-down icicles. 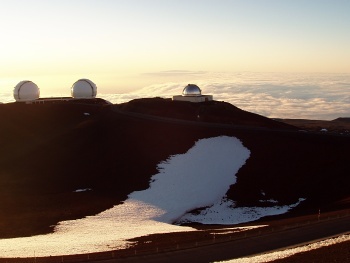 Here’s a view to the west, with the two Keck telescopes on the left, the NASA Infrared Telescope Facility to the right, and Maui—yes, Maui—in the background, peeking above the cloud layer just above the silver dome. 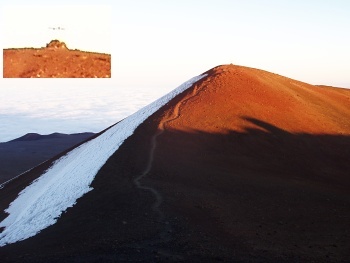 Apparently Maui’s extinct volcano Haleakala was the original choice for the first telescope, but when they went to survey it, they noticed Mauna Kea off in the distance, even higher above the clouds and the layers of atmosphere. 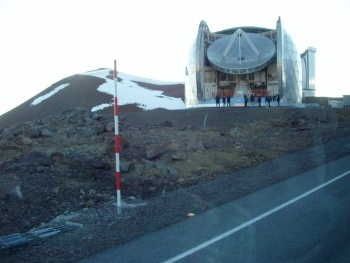 Add in the very steady air from the mountain’s shield-like shape (even when there’s wind, it’s not very turbulent), and you have an ideal site for an observatory. 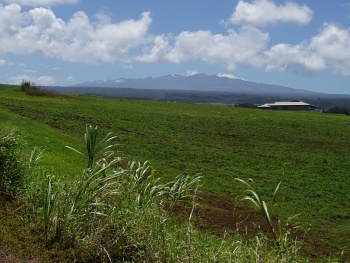 Now looking toward the southwest, you can see the mountain of Hualalai, Hawaii’s third active volcano. 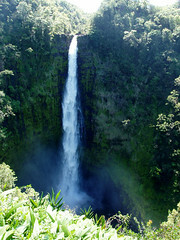 (It last erupted in 1801, but that’s just yesterday, geologically speaking.) Now, despite the fact that our hotel outside Kailua was on the slopes of Hualalai, it was covered in clouds so often that this was our best view of it all week! The sunset itself wasn’t terribly spectacular, since all the clouds were below us, but it was still amazing to be watching it from so high up. 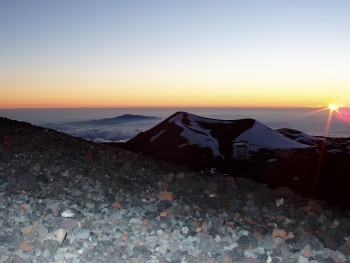 As the light faded, the optical telescopes came to life. Here’s the Gemini North Telescope opening and moving into position. Not long after the Gemini finished aiming and turned its lights off, we all piled back into the van and drove down to the visitor’s center at 9,000 feet, where they set up an 8-inch telescope and gave a quick tour of Jupiter and Mars, the Orion Nebula, a couple of star clusters, and some notable stars. It was the second time in years I’d seen the Milky Way (which used to be a fixture, back when I was camping every other month during high school). 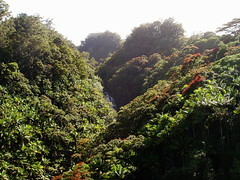 The first was two days earlier, driving through Ka‘u on our way back from Volcanoes National Park. Ironically, the two minutes we stopped by the side of the road in Ka‘u were actually better viewing because we didn’t have to contend with the light from the visitor’s center, and I’m pretty sure the air was clearer too. The one thing I regret is that we had to pile into the van before Alpha Centauri rose over the horizon. I’ve always wanted to see the closest stars to our solar system, and I’d always assumed you actually had to be in the southern hemisphere to see it. But the Southern Cross was visible, and Alpha Centauri was rising maybe an hour after we had to drive back. And the Kona coast is too cloudy to see the stars. 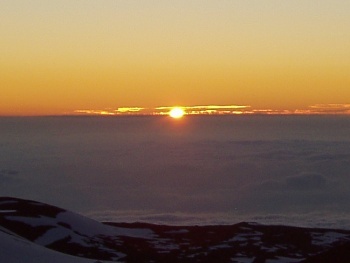 Note: This visit to Mauna Kea was on Saturday, April 9, 2005. 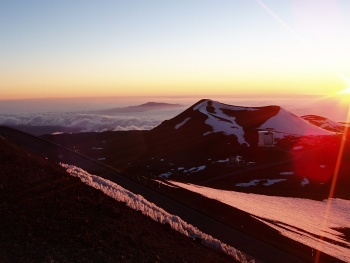 Today’s Astronomy Picture of the Day features a beautiful panorama of the Mauna Kea summit covered with snow and clouds. Keep bringing more great info and images.